Despite a superb first half of the season, Larne goalkeeper John Connolly believes the Invermen should have a few more points on the board. 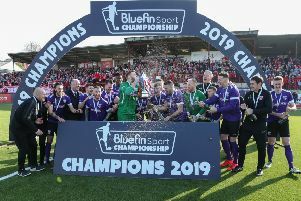 Second in the league, Davy McAlinden’s men are very much the surprise package in Championship 1, but the former Cliftonville stopper says they could be closer to leaders Bangor. However, with a new-look squad gelling together nicely, he says the team is in good shape as they gear up for 2015. “The first half of the season has gone well but we probably could be a few points better off. We have to remember how many new faces were brought in, so on that basis we have to be happy with the progress we’ve made,” said Connolly. “We are still in two cup competitions and in a good position in the league going into the New Year. With the draw for the fifth round of the Irish Cup set to take place today (Wednesday), Connolly has mixed feelings about who he would like to face.